Guidelines last updated: 13th November 2017. The BFS currently publishes two periodicals. BFS Horizons is a paperback journal of fiction, poetry and art. 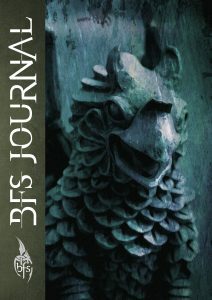 BFS Journal is now devoted to non-fiction: interviews, academic articles, reviews and features. Previous contributors to BFS periodicals include Tom Pollock, Juliet McKenna, James Barclay, Anne Lyle, Lavie Tidhar, Storm Constantine, Ramsey Campbell, Sophia McDougall, Graham Joyce, Lou Morgan, Gary McMahon, Sarah Pinborough, Mark Morris, F.E. Higgins, Michael Marshall Smith and Gillian Redfearn. 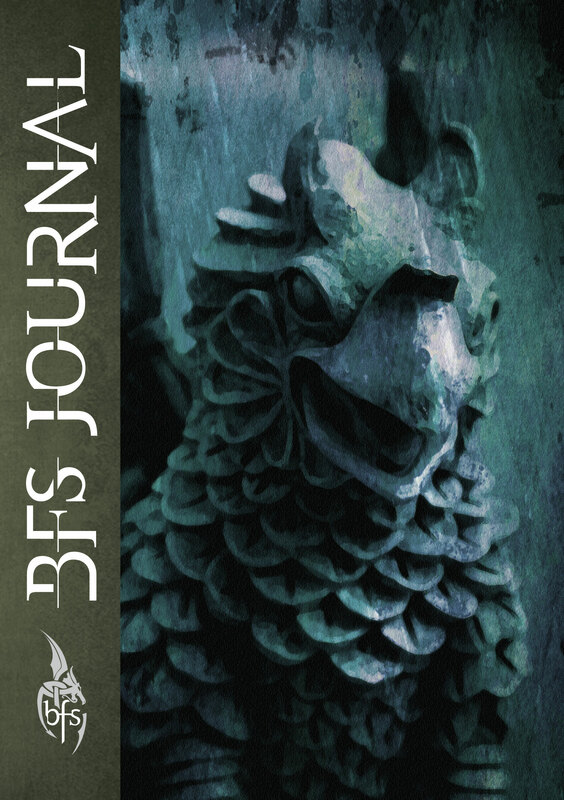 BFS Journal is a periodical devoted to non-fiction. We are looking for anything that will interest the members of the British Fantasy Society, in particular interviews, overviews, critiques, biographies, histories, opinions, ruminations, and so on. We do suggest you contact us before writing any substantial article, to check on suitability and word count. Our readers are generally quite knowledgeable when it comes to fantasy, so don’t be afraid to suggest topics slightly off the beaten track. All non-fiction should be sent directly to the editor by email. Academic articles for the BFS Journal should be between 2500 and 6000 words. We prefer nearer the former, as this is about the size of a conference paper. References in the text should be (Author, Date of Edition) with a full publication listing for the bibliography given for each article at the end. Please don’t use footnotes in your submissions. Supply any images as separate files. Use letters in the filenames to indicate the preferred order (e.g. a-arrival.jpg, b-conversation.jpg, c-departure.jpg). Publishers should note that we are always on the lookout for suitable people to interview. We might also be interested in providing our readers with previews of forthcoming non-fiction titles. We are always interested in publishing correspondence from BFS members, on any aspect of the society, not just the BFS Journal itself. BFS Horizons is devoted to fiction and poetry. Fiction: We’re mainly looking for stories of up to 5000 words, but will consider more. Authors don’t have to be British, although it would be great if stories have a thread linking it to these isles. Our definition of ‘fantasy’ is broad, encapsulating weird fiction, swords and sorcery, science fiction and all varieties of horror. Poetry: Any form will be accepted with a maximum length of 36 lines. To be honest, rhyming poetry in iambic pentameters will be a hard sell. However, it would be good to see sonnets, Villanelles or the odd Rondeau, or any other form you care to tackle. Tip: Before submitting, read your poem out loud. Does it work? Check the metre. Does it scan? Look at your line lengths. Lengthy poems or sagas will be considered, but should follow instead the submission guidelines given above for fiction. Unlike fiction and non-fiction, poems should be included in the body of the email, not sent as an attachment. All submissions must be in English. If you’re a member of the BFS, please let us know. We are looking for artists in all mediums (including photography) prepared to illustrate stories and the front cover. Please email examples of your work to the relevant editor or refer them to your website or online gallery. You don’t have to commit to doing any artwork. We aim to keep a list of interested artists, and approach them when artwork is required. The British Fantasy Society is a non-profit organisation, and the BFS Journal, being a publication put together by society members for the benefit of other society members, does not pay for contributions, but contributors who are not members do receive a copy of the journal. You retain all rights to your work, allowing us the right to distribute paper and eBook copies of the issue in which it appears. · We prefer original material, though reprints may be considered. · Simultaneous submissions are fine. Please don’t send multiple submissions (excluding poems). · Submit manuscripts by email as attachments in RTF or Word format. Do not include your story in the body of the email. We no longer accept postal submissions. · Include your name, email address, address, title and approximate word count on the first page. · Use a hashtag (#) to separate sections rather than asterisks or blank lines. · Provide a brief third-person bio that won’t go out of date. It won’t affect the decision with regard to your story, but it will save on admin later on if the story is accepted. · Title Case for Main Headings, Sentence case for sub-headings. · Double quotes for dialogue, scare quotes, etc. Single quotes only for dialogue within dialogue. · Ellipses for trailing off… followed by one space. Ellipses for showing text left out … a space on each side. · Authors’ initials should be unspaced with full stops, e.g. H.P. Lovecraft. Exception: where initials don’t stand for anything, e.g. Russell T Davies. · “Short Story Title”, Book Title, Book Series Name, Film Title, Magazine Title, “Poem Title”, “Song Title”. · Possessives after ‘s’: the BFS’s, Doris’s, etc. Go by what you (or the character) would say if reading it out loud. · UK spelling and punctuation is preferred.